“The question is one of morality,” Boston City Councilor Tito Jackson said at a gathering at the Irish Famine Memorial downtown. 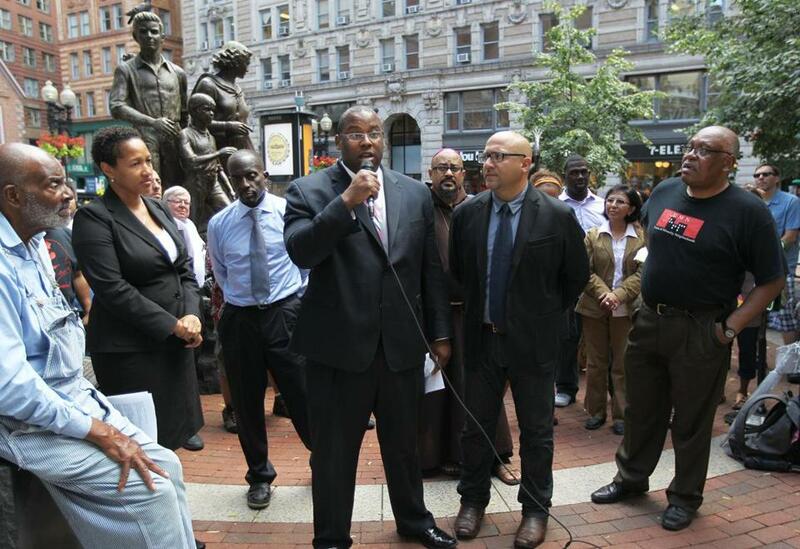 Leaders from Boston’s communities of color gathered at the Irish Famine Memorial downtown Monday, summoning the city’s history to support Governor Deval Patrick’s plan to shelter immigrant children in Massachusetts. A cavalcade of speakers shared the microphone near the outstretched hand of a statue of an emaciated Irish woman. The figure is part of the city’s memorial to the Irish Famine of the 19th century, when immigrants flooded Boston’s shores seeking refuge from starvation despite the opposition of some local residents. “There are times in our history, there are times where children show up and you can’t close the door on children,” said state Representative Jeffrey Sanchez, a Jamaica Plain Democrat. Patrick has proposed housing as many as 1,000 immigrant children who are stranded at the Southwest border after trying to enter the United States illegally while fleeing violence in Central America. He has proposed two sites: Westover Air Reserve Base in Chicopee and Camp Edwards on Cape Cod. Some residents and leaders in those communities have opposed Patrick’s plan, saying they are concerned about the burden on municipal services, even if federal money is supposed to cover the full cost of housing, feeding, and educating the children. More than 57,000 children have been taken into custody without parents or older relatives at the US-Mexico border in less than a year. “This is not an immigration issue. This is simply an all-out assault on humanitarian rights,” Pierre said, his voice echoing off the stone and brick facades of buildings around the Old South Meeting House. Veteran Boston activist Mel King read off a piece of folded paper from his seat at the edge of the memorial. “Illegal” and “immigrant” are both loaded words, he said. Instead, King encouraged Patrick’s supporters to use the word “neighbor” to refer to unaccompanied children at the border. “There are no illegal people on the planet,” he said. Mariama White-Hammond, a member of the ministerial staff at Bethel AME Church in Jamaica Plain, said residents of Massachusetts have a duty to help those in need. “We have a God-given responsibility to take care of any child that is in our midst,” she said. Toni Saunders, executive director of the Associated Advocacy Center-Visions for the Future Inc., an organization that supports children with special needs, said the Cape has room for young immigrants. On the verge of tears, Cristina Aguilera, an organizer for the Massachusetts Immigrant and Refugee Advocacy Coalition, said she knows firsthand, having grown up in Venezuela, the violent struggle some children face. “We need to make sure that they do not have to go back to be killed in their countries,” she said. Zachary T. Sampson can be reached at zachary.sampson@globe.com. Follow him on Twitter @ZackSampson.